I first saw this on the television series accompanying the new (in Christmas 2010) book, Nigella Kitchen by Nigella Lawson. Such a simple idea and I was able to take down the recipe from the TV. A shortcut possibility, or for anyone outside the UK who cannot get Crunchie Bars (though they seem to be widely available), would be to use honeycomb, also known as cinder toffee. I understand this is fairly simple to make and there are various methods online. Here is just one version: Lets make a crunchie bar (giving first a recipe for honeycomb and then turning it into home made ‘crunchie’ bites) from fellow London based blogger London Eats. If you use honeycomb rather than Crunchies, then you would need to add more chocolate to account for the missing chocolate covering on the bars. I found that the finished article was much easier to cut straight from the fridge: once it had started to warm up the portions were not quite so neat and started to crumble. My one concern was that the finished article could have looked a little prettier. I used bars of Sainsbury’s Basics range chocolate, which I understand comes from a very reputable source yet is very resonably priced and was careful not to overheat it. I am not very experienced with chocolate and I would have liked a smoother finish, however I don’t think this was the fault of the chocolate. The taste was great. As an alternative to using lined shallow square or rectangular tins Nigella suggests using disposable foil tins. I always make sure I rescue these when they come with commercially bought meals, usually desserts or cakes, rather than immediately recycling them. By the way, don’t worry about using salted peanuts, just shake off any excess salt before use. 1. Line a tin about 26cm square or a rectangular tin of similar dimensions with tin foil, smoothing out as much as possible. Alternatively use disposable foil tins (see note above). 2. Tip the peanuts into a large hole sieve or colander and shake over the sink to remove excess salt. Tip them into a medium sized mixing bowl. Crumble and add the Crunchie bars. Stir to combine. 3. Gently melt the butter and golden syrup together in a heavy based pan. As it melts break up and add the chocolate bars. Stir until dissolved, but do not allow to boil. 4. When the mixture in the pan has just melted pour it over the nuts and broken Crunchies and stir together. 5. Pour into the lined tin or foil tray. Spread out to the corners and try to flatten it as possible. A spatula will help with this. 6. Cover and place in the refrigerator for several hours. Remove and slice, working quickly before the mixture starts to warm up, which I found made it more difficult to cut accurately. I could be cut it into chunks, wedges or even random shapes. 7. Store in the fridge until you are ready to give away. Placed in small decorative boxes and wrapped with cellophane this makes good Christmas gift. It could also be served as a ‘naughty nibble’ with a cup of coffee! A while ago I was invited to an ‘all girls’ afternoon tea by a friend. Lots of tea served with dainty little savoury nibbles, scones and cake … wonderful cake! One cake in particular took my fancy. 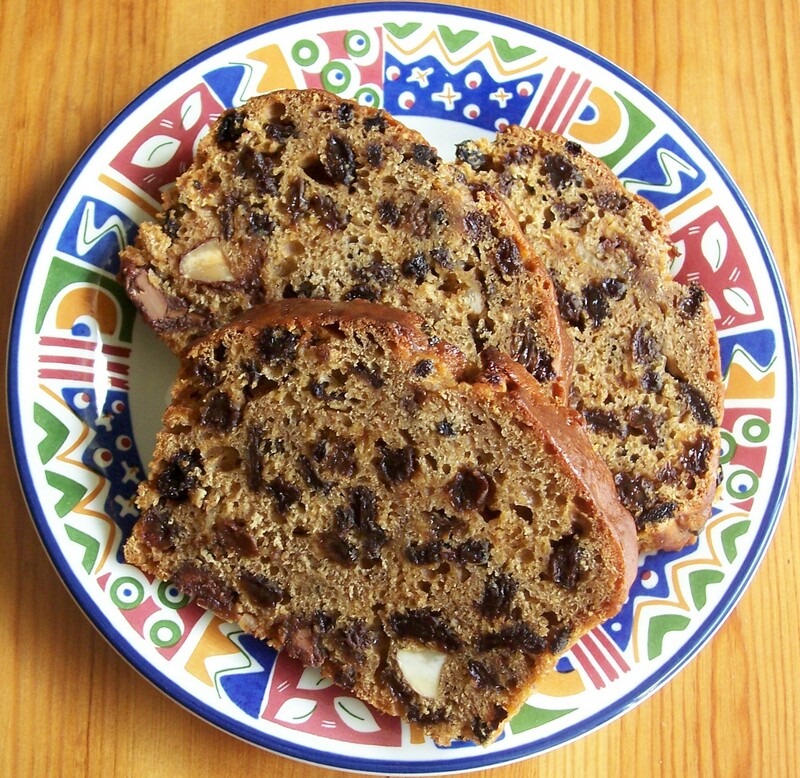 A moist cake filled with dried apricots and prunes which had been soaked in strong coffee. 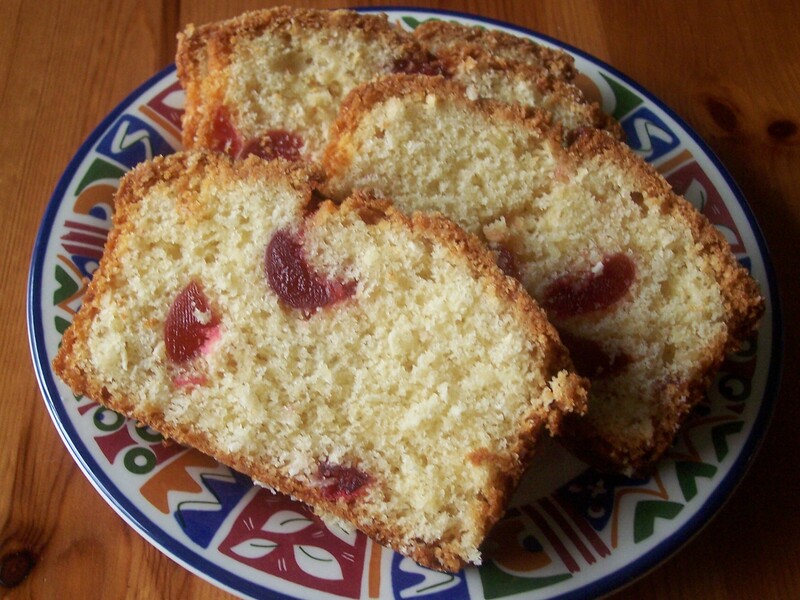 I had made cake with fruit soaked in tea before, but never soaked in coffee. Over the following days I did some hunting and some experimenting. I love Mocha (the mixture of coffee and chocolate) and one recipe that caught my eye added nut chocolate to the cake mixture in place of fruits. Unfortunately the recipe was tasty but the mixture far too moist, so not really successful. 1. Soak the fruit and sugar in the cold coffee, preferably overnight. 3. Line a 2lb loaf tin. 5. Mix the egg and the flour with the ingredients that have been soaking overnight and the chopped chocolate and nuts. 6. Pour into the prepared tin. Push down any pieces of chocolate that stand out from the cake mixture so they are hidden: this prevents the chocolate from burning. 7. Bake for about 55 mins – 1 hour and turn out when cool. Cool on wire tray. At the end of November I made several cakes to feed friends at a church event, settling on a Mixed Fruit & Ginger version of our favourite (never known to fail) Knock Up Fruit Cake, a double sized Fragrant Marmalade Cake, made in two sandwich tins with more marmalade spread in the middle plus, as a nod towards Christmas and having come across the recipe the previous week, these White Christmas Slices. They proved to be very ‘moreish’ and I am thinking of making some more batches to give away at Christmas. I discovered this competition winning recipe by Caroline Richards for White Christmas Slices in my local Sainsbury’s supermarket: one of many free cards available, in this case giving new ideas for Christmas food. It appealed because, not only did I have everything available at home (apart from the inexpensive and easily bought coconut biscuits and the white chocolate), it also looked quick, easy and did not require baking. I rarely make a recipe exactly as written and adapted this just a little. Firstly, I cut the amount of butter by one third as I do not like to add too much unnecessary fat. Secondly, I felt the original recipe was lacking something and decided the something was fruit, or similar. To compensate I added dried cranberries to give one of the flavours of Christmas: glacé cherries, sultanas/raisins, dried apricot, fig or date or even crystallised ginger could be added instead. In fact I have decided that this successful – and useful – little recipe is highly adaptable, so variations may be posted here. I have my eye on a gingery version, which I know would be a great hit here! These slices are quite rich so do not make them too large: I cut mine into bite sized squares. Update 22.12.12: I have just made my third batch of these this year – they go like hot cakes, or should that be hot slices! 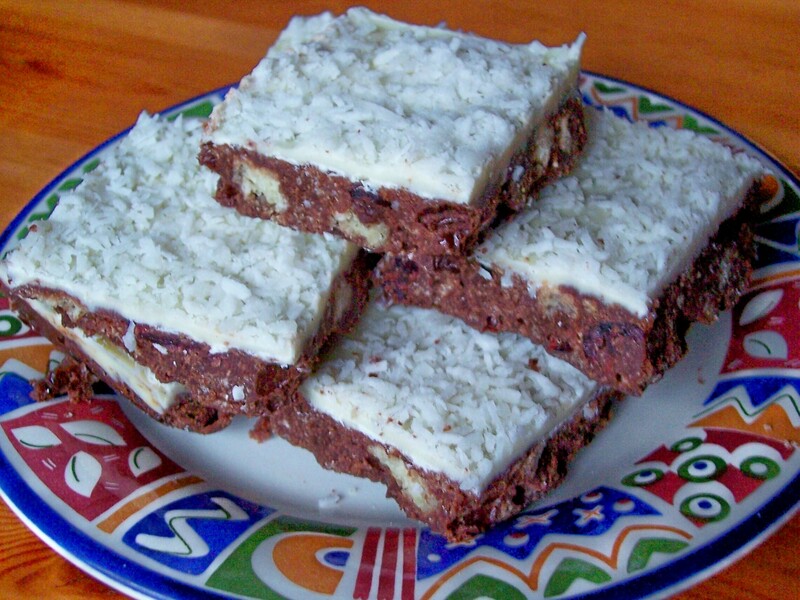 I have also made Nigella Lawson’s Sweet & Salty Crunch Nut Bars, from her new book Kitchen, but the post will have to wait for another occasion. 1. Gently heat the dark chocolate, butter and runny honey together in a pan, stirring with a spoon until the chocolate and butter are melted. 2. Crush the biscuits in a bag until they are large chunks and crumbs. Do not crush too much. Add to the melted chocolate along with the dried cranberries, if using. 3. Carefully stir, continuing for about 5 minutes until well coated and so the mixture starts to cook. 4. Using a spoon, press the mixture down well into a 30cm x 20cm baking tray lined with foil (or cling film as suggested in the original recipe, but foil is easier to handle). 6. Sprinkle over the desiccated coconut. Place a layer of cling film on top and chill for 4 hours. If you are short of time then the covered tray can be placed in the freezer for about an hour, but do not leave too long as chocolate is better if it is not frozen for an extended period. Do not cut from frozen as it will shatter. 7. Once it is set, place the block on a board and while it is still cold cut into small squares with a sharp knife. 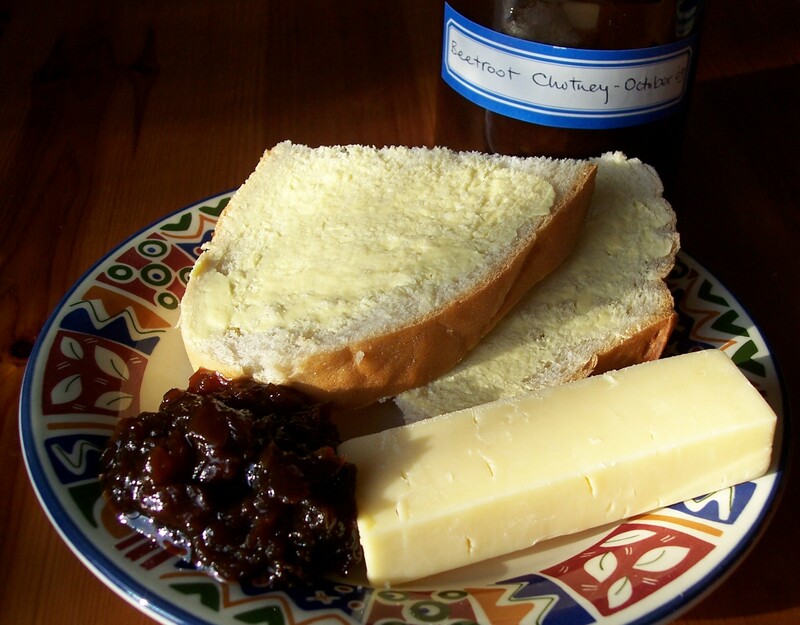 If it warms up it is more likely to crumble, and should be returned to the fridge to harden before cutting. I cut my block 6 squares by 4 squares, giving 24 bite sized pieces. That was back in early February and a short while later I discovered a small recipe card in Sainsburys supermarket with a fairly similar recipe called Choc-banana Crumble, (also here) recommended as a Mothering Sunday treat. It was also part of the 2010 Fairtrade fortnight campaign (22 February – 7 March) encouraging consumers to change one or more shopping item in their basket to a Fairly Traded alternative, as the recipe includes Fairly Traded ingredients: chocolate powder, bananas, sugar and nuts. (The Fairtrade Foundation seeks to promote justice and sustainable development, encouraging consumers to buy Fairly Traded items to give a fair deal to marginalised producers in developing countries.) When I made the Sainsbury version we found it rather dry but the second time I improved this by adding orange zest and juice, which also stopped the bananas from browning. The orange, along with dessicated coconut, also added much more depth to the flavour. Pineapple juice (not very popular in our house, which is why I did not choose it) would make a good alternative to the orange juice, making this crumble even more tropical. The bananas need to be fairly ripe: I have used underripe bananas but they did not soften properly and made the dish seem flavourless. 1. Preheat the oven to 190ºC/170ºC Fan/370oF/Gas 5. 2. Put the sifted flour, chilled butter, drinking chocolate and sugar in a bowl. Using fingertips, rub the mixture together until it resembles fine breadcrumbs. Stir in the nuts and half of the dessicated coconut. 3. Peel and slice the bananas and reserve a few slices for decoration. Arrange them in the base of a large shallow ovenproof dish. Sprinkle with orange zest (reserving a few strands to decorate), the remaining dessicated coconut and pour over the orange juice. 5. Bake the dish for about 20 minutes or until piping hot. Remove from the oven and allow to rest for 5 minutes before serving. 6. Serve with crème fraîche, cream or warm custard. On Good Friday we make Hot Cross Buns to remember Jesus’ death on a cross and it therefore seems appropriate to mark Easter Sunday and beyond with the symbolic use of eggs to represent the resurrection and the new life that Jesus brings. I bought some little pastel coloured sugar coated eggs to decorate my Simnel Cake in a ‘take a bag and scoop and do-it-yourself’ shop. Then, on a whim, I bought a few more: I, or perhaps my daughter, could make some little chocolate cereal nests. Most people with children are likely to have had these brought home from school and may even have made them in a family home cooking session. However I realised that the last time I made them it was with a special kit that came with a packet of Rice Krispies so I did not really have a recipe. Searching online was simple and there seem to be two methods. One includes butter/margerine and golden syrup. The quick and simple method, the one I have chosen, is just melted chocolate and cereal, with the optional of adding extra ingredients such as coconut, raisins or cherries. Cornflakes can be substituted for Rice Krispies as can, I understand, Shredded Wheat: I have not tasted this last, though it could look rather like the twigs in a nest. 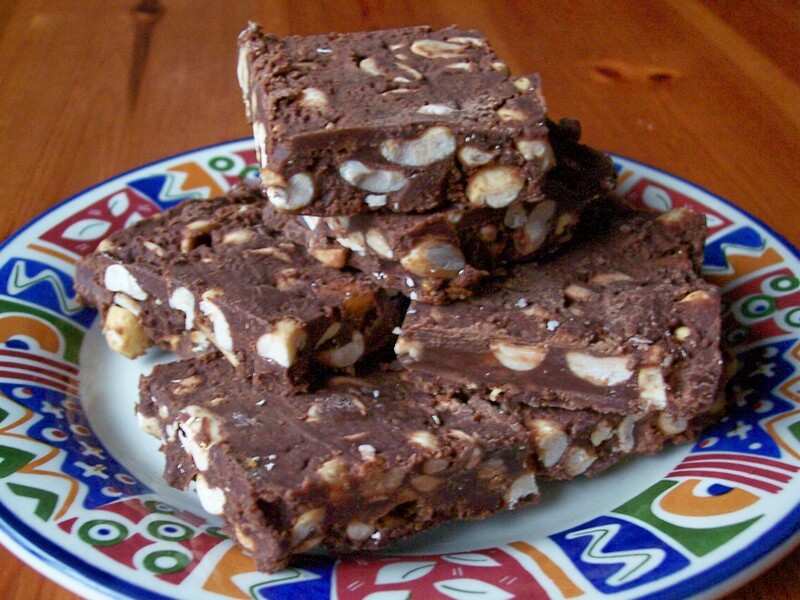 An internet search led me to the Netmums site and a recipe called Chocolate Crispies. There are two or three other simple recipes (including one for Banana Flapjack, which is a good way of using a glut of ripe bananas). 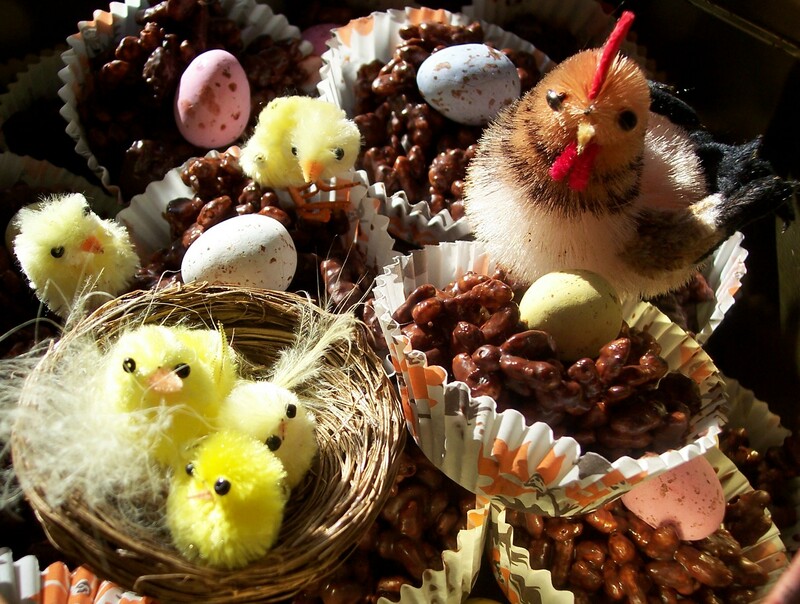 We included some sultanas for good measure, finishing with sugar eggs – a hen and chicks were also added as Easter decoration. The original recipe is for a larger amount of chocolate but we scaled it down for the one bar of chocolate that I had bought and found 24 nests to be ample (I was more generous with the raisins than the original). There is also a suggestion that cornflakes or other cereal could be used if you don’t have rice crispies and that the nests could be served with chopped bananas. 2. Put in the rice crispies and raisins (or alternative extra ingredient if you have chosen one) and stir until well covered with chocolate. 3. Place individual paper cases into small tart or muffin tins and put spoonfuls of the mixture into these. 4. Place 1 or 2 mini eggs on top while still the chocolate is still soft (number depends on size of eggs/nests and personal choice). 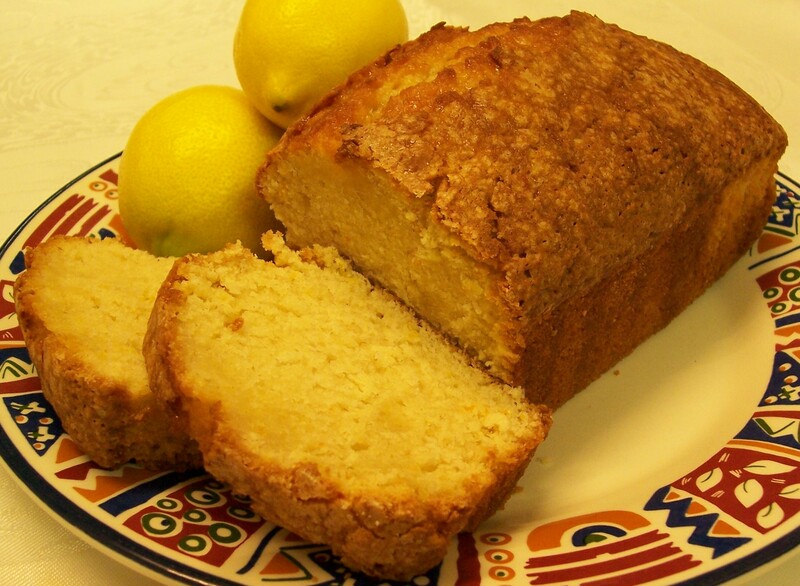 Leave to cool and set – can be put in the fridge for a short time. 5. Lovely for tea-time on Easter day decorated with a small edible egg, or at any time of the year replacing the sugar egg with half a glace cherry. At Christmas a piece of cherry and two pieces of green angelica give the seasonal look of holly. Nice book, shame about the waistline! I had a birthday recently and my brother and family bought me a copy of this book, along with some Divine Fairtrade chocolate bars. A sort of starter pack to get me cooking, I assume. The author has long been a supporter of fair trade and has collected and created the recipes in the book using Divine chocolate, which uses quality cocoa beans grown by the farmer members of Kuapa Kokoo cooperative in Ghana, West Africa, who get an internationally agreed fair price for their product. The story of this cooperative, who also co-own the company and share its profits, is told in an illustrated introductory section. Also in this section is a guide to the unusual Adinkra symbols which feature on the cover of both the book and Divine chocolate wrappers. Once past some basic ‘how to’ pages the recipes start, organised into nine gloriously mouth watering chapters. Some are reasonably simple: ‘Luxurious Flapjacks’, ‘Divine Brownies’, ‘Chocolate Stuffed French Toast’ or ‘White Chocolate Strawberry Cream Cake’. Others are a little more complicated: ‘Black Forest Roulade’, ‘Creamy Cappuccino Cheesecake’, ‘Bourbon Street Beignets’ or the ‘Deliciously Different Christmas Cake’. And of course, there are those with intriguing names: ‘La Torta di Cioccolata’, ‘Orange and Chocolate Jackson Pollock Cake’, ‘Zebra Mousse’ or ‘Red Hot Chilli-Pepper Chocolate Cake’. Towards the end there are even a few savoury chocolate recipes, including ‘Mole’ (the famous Mexican dish of chicken with bitter chocolate sauce). There is something here for all types of chocoholic, whether ‘quick fix’ or more adventurous! All royalties from the sale of the book and sales of Divine chocolate benefit the farmers of Kuapa Kokoo and their company, guaranteeing a fairer deal for thousands of cocoa farmers. Divine is available in bars of Plain, Milk or White chocolate. ‘Sticky upside down chocolate pear gingerbread’, anyone?! This review was written for and first published in the Parish of Walthamstow Magazine. Welcome to my Cookbook - thank you for Meandering with me. I appreciate comments and if you make recipes or use information I have posted I would be grateful if this site, preferably the appropriate post, is credited. Photographs and text are my own work unless indicated otherwise and permission should be sought before use or reproduction. Permission for copies of entire posts to be re-posted online will not be granted. I reserve the right to remove links from, or completely refuse, comments (including those to languages I do not understand) and will delete 'pingbacks' I deem to be spam or that link to advertising.